susceptible to grub attack during the months of December to March. Also know as Lawn Army Grub, its appearance may vary depending on your area and the worms maturity. Juvenile worms will be a bright transparent green and as it matures Armyworm become a brownish green colour sometimes with dark and light markings down its sides or back. Armyworms feed on your lawn in large masses and once their food source has been exhausted they will move on to another area. This common pest will eat your lawn almost down to bare soil, however the first signs of Armyworm infestations can be noticed when small patches of lawn seem to be cut down near to the ground, almost as if it has been mowed. If unsure you can check, first prepare a bucket of warm water and add a small amount of liquid soap, something like hand wash or dishwashing liquid will work fine. Pour this soapy solution onto the area, soon any living organism i.e. 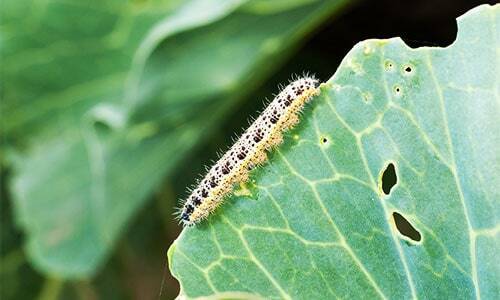 earth worms, beetles, bugs will come to the surface including Armyworms if present. Immediate treatment of your lawn with a pesticide will prevent the infestation getting out of hand. Although the damage is unsightly, your lawns roots should be still intact and it will only be a matter of applying a organic repair fertiliser and with a little TLC your lawn will be back to lush in no time. We’re happy to help you with any queries you may have on armyworm or our turf varieties. Contact us.